Next weekend is our bi-annual church retreat at the HEB Foundation camp down on the Frio River. We love the retreat. The river is beautiful. You can't get cell service. And you're with friends all weekend. I spend most of my time reading a book by the water. It's just a lovely, restorative time. Everyone has a job during the weekend, and for about ten years now the job of the Beck family has been to host the talent show on Saturday night. We take our job seriously, and have left our stamp on the evening. When we inherited the show it mainly consisted of old camp gags, getting some unsuspecting person to come up to trick them into sitting on a wet sponge or get soaked with water. We nixed all that. The show is now geared toward talent and not making someone look silly. Now, the word "talent" is broadly interpreted for our show. A small child might come up to tell a Knock-Knock joke or sing "Twinkle Twinkle Little Star." Middle-schoolers do comedy skits, some old camp standbys, but most are original works created by the kids. We get story tellers, dancers, and a lot of singing and instrument playing. It's just a fun, fun time. But the biggest impact we've had on the talent show is the Scooter Pre-Show. Smooth concrete paths link the camp, so children bring their scooters. All weekend they scoot around. 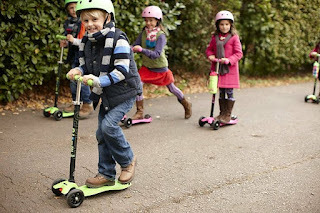 Well, a lot of these kids have a "talent" for riding the scooter. So every retreat kids come up to us wanting to ride their scooter as an act in the talent show. Now, an important part of being the talent show host is protecting the audience. Jana and I try to keep the show to about 90 minutes. More than that it gets tiring. Your child is adorable, but not that adorable. All that to say, we can't have ten scooter acts, each wanting to go round and round in a circle while we play an entire Taylor Swift song. Still, we wanted to include these kids. So we invented the Scooter Pre-Show. As the show gets ready to start, a line of kids on scooters begins to form just off stage left of the pavilion. About 15-20 kids get lined up each show. Then, to kick off the show, I crank up a rock song (my preferred song is "Sweet Child of Mine" by Guns & Roses). Once the music starts, each kid rides out, one at a time. Each child does two loops in front of the cheering crowd, and then exits stage right while another child enters from stage left. One song, 15-20 scooter acts, in and out, and everyone is happy. The child, Mom and Dad, and a grateful church family. For many, the Scooter Pre-Show is their favorite part of the show. It's a blast, especially when really young kids come out. So cute. It's such a tradition that last retreat I joked that when Jana and I are dead and gone the most lasting impact we will have had on our church is the invention of the Scooter Pre-Show.